This work highlights the coming age of management information systems for all types of executives by focusing on executive information systems, or EIS. Serving as a data-intensive system, an EIS offers a snapshot of a company's past and present operations as a way of predicting the future. 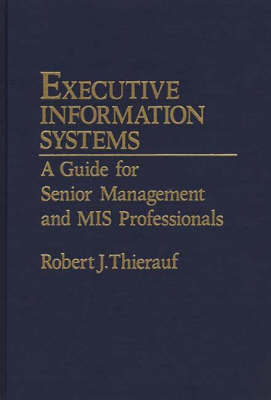 In this book, Robert Thierauf provides a complete picture of executive information systems, from an introduction of what these systems are all about, to the hardware, software, and applications that form the basis of an EIS environment. The work is divided into four basic sections. The first provides an overview of executive information systems, discussing the real need for an EIS, the essential characteristics underlying it, and its relationship to prior management information systems. The types of executive decision making typically found in an EIS environment, illustrated with specific examples, are also examined. The second section focuses on the computer hardware and software that is useful within an EIS operating mode, along with on-line databases that assist executives in decision making. The development of executive information systems is covered in section three, which features current approaches for executives and their staffs as well as methods to be followed by the Management Information Systems department. Finally, section four addresses various aspects of working in an EIS environment, including strategic planning, marketing, manufacturing, finance, and personnel. A master case study is presented, and each topic is explored in relation to it. Typical EIS applications are also described for each of the topic areas. With its combination of both EIS theory and practical applications, this work will be a valuable resource for senior executives and MIS professionals as well as for students of management and information systems. Public, academic, and business libraries will also find it to be a useful addition to their collections.